This means that boxers need to include all of these areas in their development, many daily and weekly tasks to piece together. 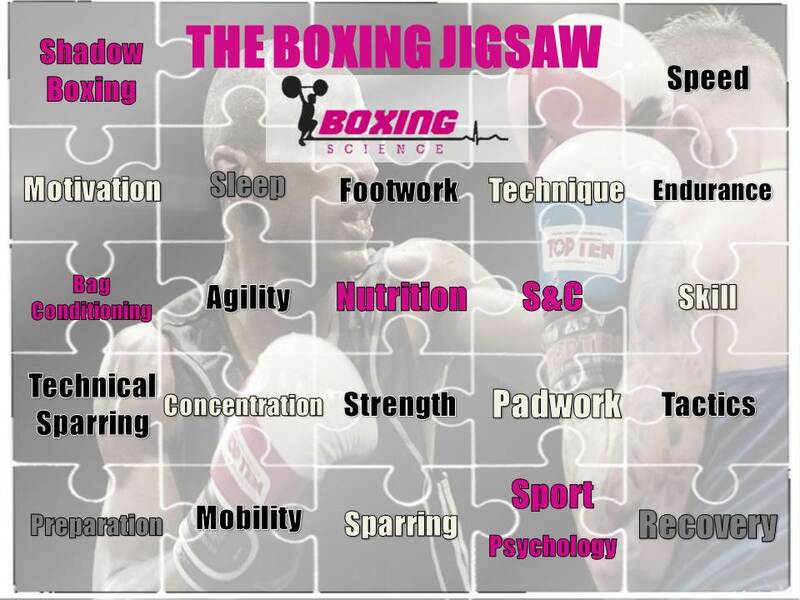 Above is a jigsaw of the tasks that boxers have to include in order to develop. Each piece represents the Four Corners Dr Pete Olusoga introduced… physical, technical, tactical and psychological variables (read more here). The jigsaw above is quite self-explanatory, and there are many more elements that need mastering. The full picture of a successful boxer is made up of a number in-depth qualities, but here are the rules for putting together the boxing jigsaw. This is the most abundant of the rules. A missing piece in our jigsaw affects the full picture of the athlete. Not only that, but it affects the impact of the other pieces. Many boxers ask me whether they are ‘fit enough’ or ‘8-round’ fit. This isn’t dependant on your running performance, this is how well your sparring is going. The conditioning is there to supplement your boxing performance, if you are not sparring enough, your boxing jigsaw falls apart. Example – S&C sessions will not be as effective if not fuelled with the right nutritional or recovery strategies. Jordan feeling the effects of the curve. Applying the correct nutrition and recovery strategies are vital for him to get the most out of training. There is no such thing as the perfect athlete. Otherwise, as well as being the king of speed, Usain Bolt would win the marathon and realise his dream of playing for Man United (which he probably could do at the moment). This creates a hierarchy of importance of our pieces. Some pieces will make up the standout feature of the jigsaw, some will create the background, they all make the picture. Example – In boxing, recovery and sleep are important to prevent fatigue and optimise training effects. However, the technique and force of your punches are much more important, otherwise sleeping beauty would be world champion. Except from the inserts, jigsaw pieces are generally the same size as it’s counterparts. In this instance, the size of the pieces are determined by whether there has been enough attention paid to that area. You may have done mobility sessions in a training camp, but will only one session per week be effective? If it is important, do it everyday! If a piece of the jigsaw is not optimised to it’s full potential, the full picture can be affected. Example – Attending only 70% of your S&C sessions you won’t be optimising overload and taper strategies, the size of that piece is then affected. As mentioned, each piece has it’s own placement and importance in relevance to creating the featured image and setting the background. But what is important is the timing of placing the pieces. The jigsaw example cannot represent a logical time-management approach. But to optimise the impact and effectiveness of the pieces, timing is key. When do we do our S&C sessions? When do we have our recovery meal? When do we chill out? These are important factors that require effective timing. Example – Have conditioning sessions back to back will accumulate fatigue and could decrease the effectiveness of the second session. If you’re an athlete reading this, thinking there might be some adjustments to your jigsaw – EMBRACE CHANGE. Change requires an investment of risk taking, time, maybe even money. But the world is forever changing by making these investments, whether it be in sport, politics, business, technology. If you are not open to change, you may be left behind.